But, as we all know, it’s only good advice when adults can be trusted to do or say the right thing. In general, we’re well meaning but we don’t all have a degree in child development or psychology. It doesn’t matter. Kids still need us to step up. 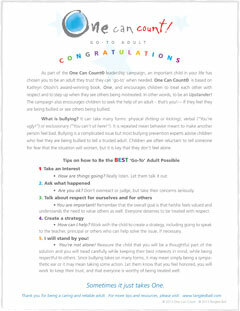 So in the spirit of the Tangled Ball Theory of pulling out one string at a time to help a child, award-winning author of One, Kathryn Otoshi, along with Tangled Ball came up with the One Can Count Go-To Adult campaign. The elementary school counselor or trained teacher or staff member talks to the class (recommended for grades as young as 3rd Grade and as old as 8th Grade) about bullying. The students are then encouraged to talk to a trusted adult when they feel they are being bullied and to think about who that person might be. It should be someone they feel very comfortable talking with, such as a parent, grandparent, aunt, uncle, trusted teacher or adult family friend. 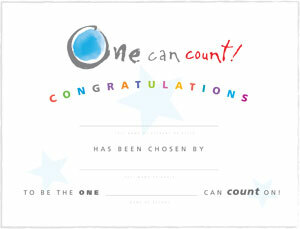 Ask students to fill out the One Can Count Go-To Adult Certificate with that person’s name. Present it, along with the One Can Count Go-To Adult Congratulatory Letter, to the person of their choice. Download free certificate and letter. One can count in a child’s life!